Visiting with the novitiate community in India | Walk with us! 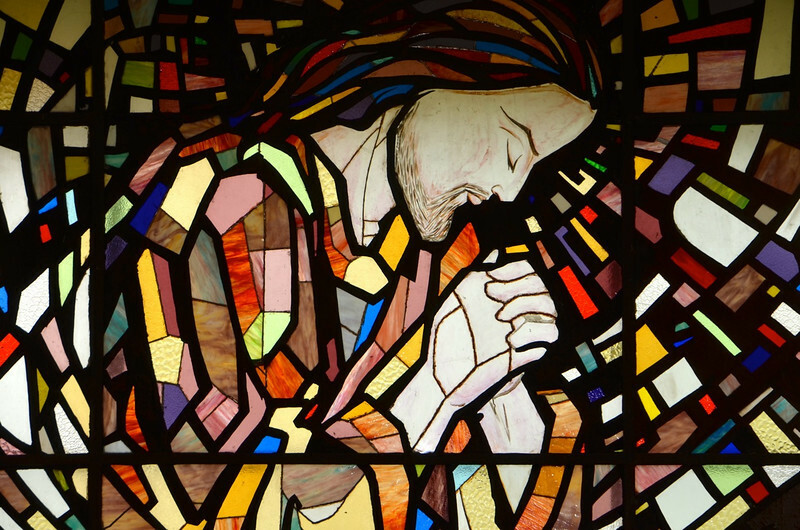 The stained glass window behind the altar at the novitiate chapel in India. As is common when a visitor comes, there is a welcoming ceremony. Fr. Peter Chris, the postulant master, welcomed me to the novitiate. I received a garland of flowers and was presented with coconut milk (I’m not very fond of the stuff, but with encouragement took several sips). Personal greetings from the novices and postulants followed, well at least from most of them. Two of the novices were on a day of silence and would not break that silence until dinner at 7:30 p.m.
Fr. 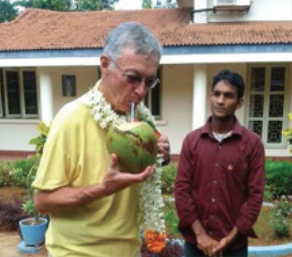 Tom tries a bit of coconut milk, though admits that it isn’t his favorite India treat! It was good to meet up with the novice class. They were a large part of my time and life while at Eluru last winter. My fondest memory was of our four-day pilgrimage to the shrine of Our Lady of Health at Velankanni. The novitiate house is built as an ashram (a spiritual hermitage or monastery often used for meditation and/or religious instruction) not far from the city of Guntur, Andhra Pradesh, in an area called Nambur. There are Christian Ashrams throughout India and to call our novitiate “Sacred Heart Ashram” is very appropriate as the novitiate year is dedicated to learning about religious life, developing a deeper prayer life and spirituality, and establishing one’s identity as an SCJ through the study of our founder, Fr. Leo John Dehon, Our Rule of Life, and the history of the congregation. For the novices, Sunday is both a day of rest and a day of ministry to the community and in our nearby Sacred Heart Parish. 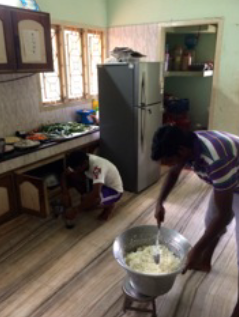 The ministry to the community is centered in the kitchen. The women who do the everyday cooking have Sunday off so the task of providing a meal falls to either a group of postulants or novices. All of the novices (and postulants) get their turn to display their culinary talents over the course of the novitiate year. Fr. McQueen, the novice master, is no stranger to the kitchen either and lends his expertise from time to time. If they are not in the kitchen then you’ll find the novices helping out at our parish or one of its substations teaching catechism or working with youth. The parish Sunday Mass is at 10:30 a.m., though the novices already had their community Mass at 7:00 a.m., at which I was the presider. The afternoon is free for rest and reading as well as sports. Alas, there is not enough land for a cricket pitch so the favorite games are badminton or basketball. I am back to my walking routine here and yesterday I ran into a monkey. It was sitting just off the walkway and it stared at me and I stared at it. On my next circuit it was gone.